I've now elevated this thread to sticky status, given its success through the years. How's this for an 8-box? I went on to have an all-blue 5-box, and the offer increased to £29. I shunned the contestants' current era of cautiousness, however, throwing it to the wind - I was going for this! 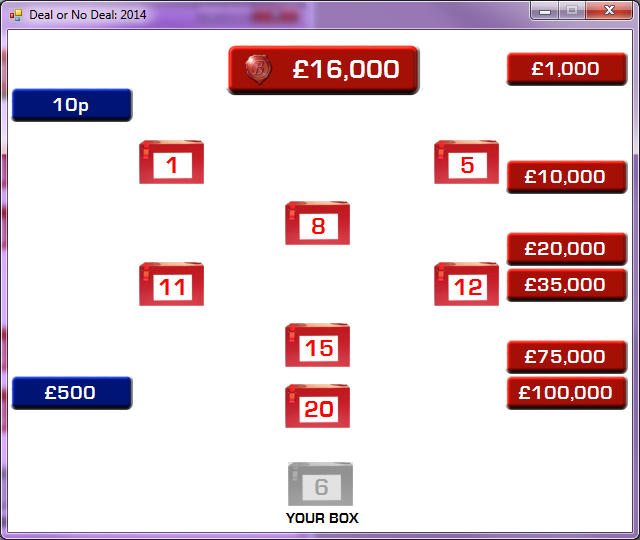 I was rewarded, with a two-box of £1 and £500, and the offer subsequently sky-rocketed - to £240! 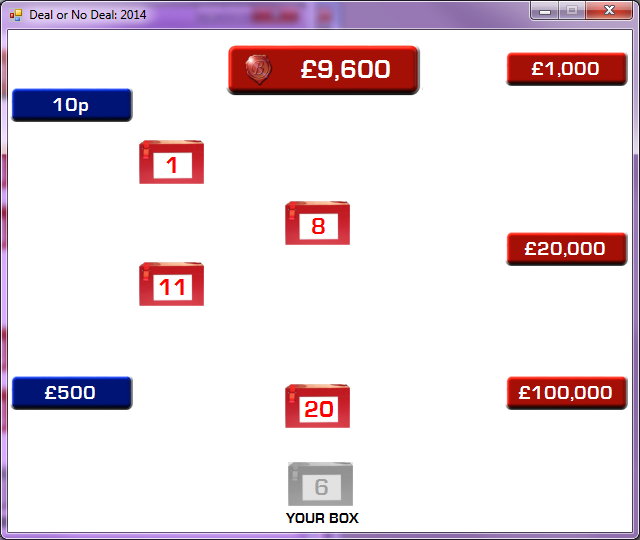 I dealt the £240, as I would in reality, and had the £1 in my box. 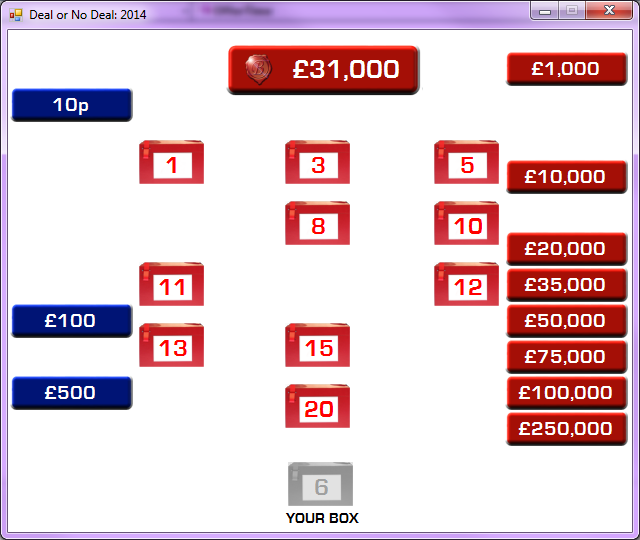 Peak offer had been £2,300 at 14-box. I took full advantage of a "your next offer will be multiplied by 5" twist, and this was the result. One of these days I'm going to make a new version of that game. I think American Coupon Boy will take the place of the 1p. I have a really, really, really cool site. Yes, Jacques; and I have a wonderful idea for who the £250,000 should be. 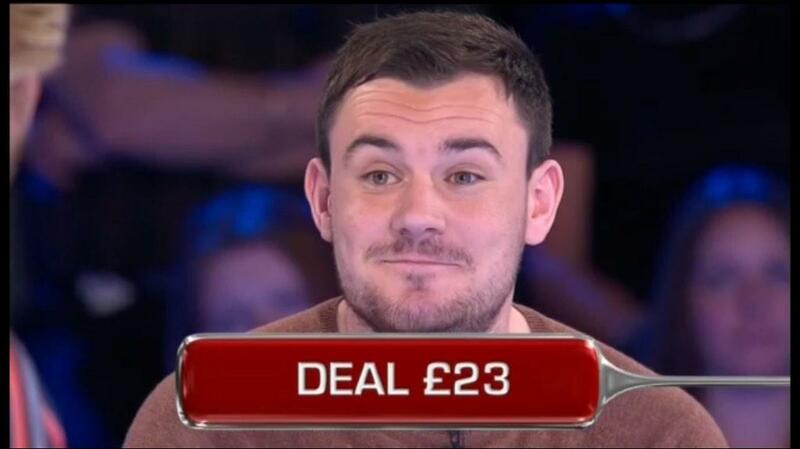 You can be the £100,000, Joel can be the £75,000. Hey, I was the 10p last time. YES, I get to be the number people want throughout the game. Last edited by daniel123 on Mon Sep 09, 2013 10:39 pm, edited 1 time in total. Host and co-developer of forum Race to a Billion - Season 7 now in progress. Follow us on Twitter @racetoabillion. Race to a Billion Season 7 Live Leaderboard can be found HERE. Host of Aaron's DoND, now in its fourth season. Drop me a PM if you wish to arrange a game. Also a Eurovision enthusiast and fellow member of #teambat. 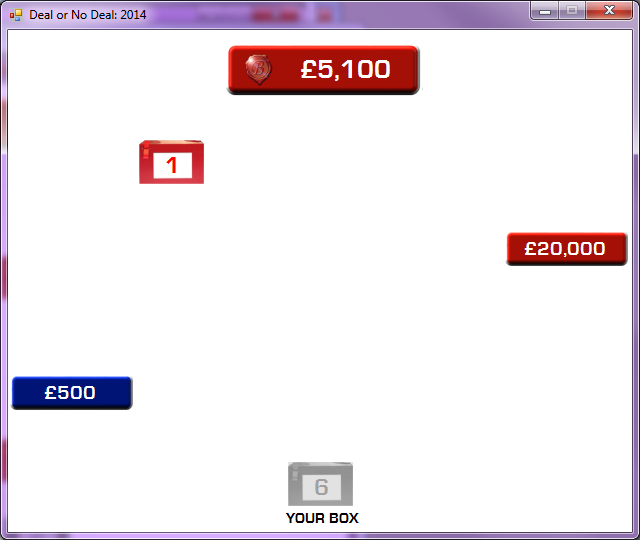 I'd expect a stick or even better if I knock out the $500k, so NO DEAL! Can you show more screenshots of La Banquire. Recruiting contestants for Race To a Billion Series 4, join HERE! viewtopic.php?f=14&p=847549#p847549 DO YOU LIKE THE IDEA? Le Banquier is quite similar in design, but I'll post some in a few minutes! I'll go for 15 as my case! Yes Davao, that's because you are CHEATING!